This Hubble Space telescope image shows the gargantuan galaxy M60 in the center, and the ultracompact dwarf galaxy M60-UCD1 below it and to the right, and also enlarged as an inset. Today, astronomers announced the discovery of an object — a supermassive black hole in the center of an ultra compact dwarf galaxy — that will surely shift our understanding of how galaxies evolve. For some background, a supermassive black hole is a black hole that is much larger than their “stellar-mass” counterparts. Generally, such massive black holes reside in the galactic nuclei (the center) of larger galaxies. In the case of the Milky Way, this object is called Sagittarius A*, and it helps hold the galaxy together through its immense gravitational force. 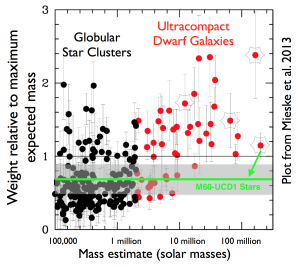 Now, An ultra compact dwarf galaxy (UCD) has spawned a new classification of dwarf galaxies. Dwarf galaxies are about 200 light-years across and harbor around 100-million stars. It’s thought that these galaxies are remnants of galaxy mergers, which exert tidal forces on neighbors, stripping the stars within the galaxies of their gas. The UCD in question is M60-UCD1. In the picture, the very bright galaxy is M60, and the little ‘star’ highlighted near the bottom right is the dwarf galaxy. This is the smallest (and lightest) object we’ve found with a central supermassive black hole, but the fun doesn’t end there. This black hole is truly massive, weighing in at 21-million solar masses. For some perspective, the Milky Way’s supermassive black hole is only weighs 4-million solar masses (that is million with an “m”). If we looked at some of the incredible numbers here, this means the black hole at the center of this dwarf galaxy is 5 times larger than the Milky Way’s, even though the dwarf galaxy has less than 1% of our mass. 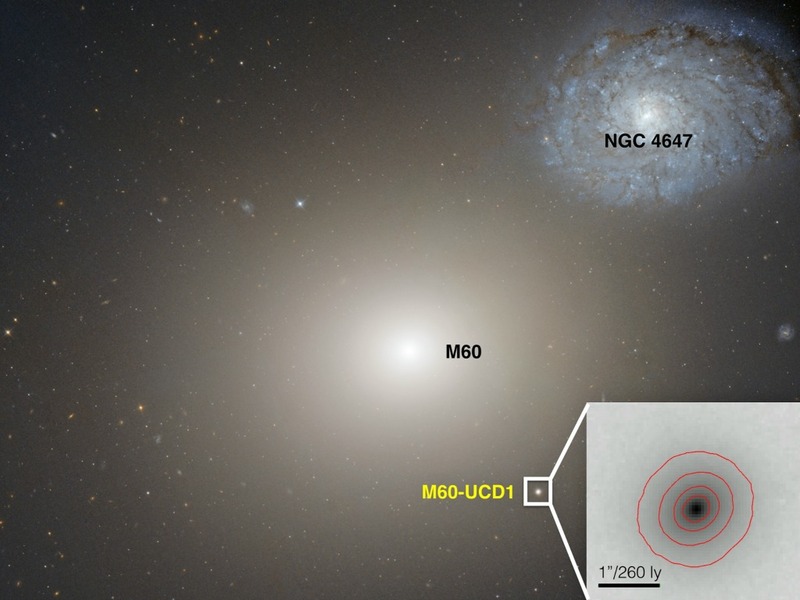 The supermassive black hole at the center of M60-UCD1 is 15% of the galaxy’s total mass, which is huge. We believe this once was a very big galaxy with maybe 10 billion stars in it, but then it passed very close to the center of an even larger galaxy, M60, and in that process all the stars and dark matter in the outer part of the galaxy got torn away and became part of M60. That was maybe as much as 10 billion years ago. We don’t know. According to Anil Seth, an astronomer at the University of Utah and one of the lead researchers on this project. M60-UCD1 could be doomed, because astronomers think this dwarf galaxy is in the process of merging with M60, a galaxy with a.5-billion solar masses supermassive black hole of 4 (this places M60 as being one of the largest galaxies in the “local universe.” If true, M60 would probably be the best candidate for having stripped the stars away from M60-UCD). Obviously, astronomers are going to look at other UCD galaxies to see if they can find additional central supermassive black holes. If this is commonplace, it will significantly increase the number of supermassive black holes we think exist in our universe and it will provide us with many more objects to choose from when trying to study these exotic things. However, UCD galaxies are very hard to find because they are so small, they actually tend to look like a star from our perspective. We can only distinguished them from other stars when we analyze their light spectrum, revealing it to have many different types of stars. 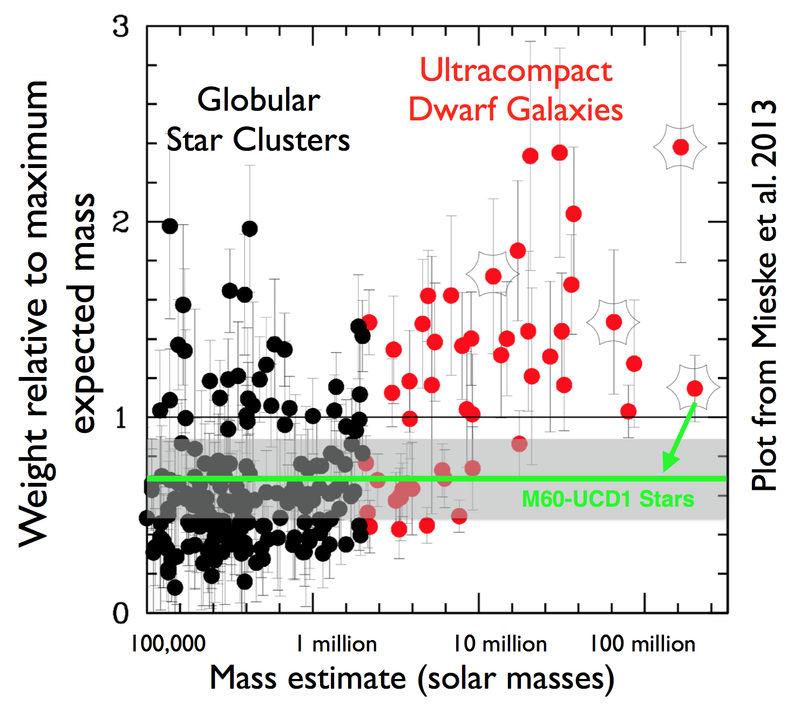 The few UCD galaxies we know about tend to be heavier than we expect. Since the stars have a “normal” mass, we can assume that there are other dark objects residing in these galaxies that give them the added mass. If they all have supermassive black holes, this would go a long way to figuring out where all of that extra mass is. Second, Seth and a team of astronomers are going to apply the same reasoning to globular clusters, so they are going to look at the globular clusters in the Andromeda galaxy. It’s thought that some globular clusters (more specifically, the larger and more dense ones) are remnants of galactic cores that merged with the parent galaxy eons ago. If true, these globular clusters should have black holes at their center. Some of the evidence for this is controversial, an example can be found here in the Milky Way with Omega Centauri. Some of the evidence proposed claims the cluster has a black hole at the center, and other findings suggest otherwise. In an effort to get a better field of view (and, in some ways, better resolution), Seth and his team are looking to Andromeda to help settle this debate. For related reading, learn why our supermassive black hole could be a wormhole here.